Many of us especially women are always complaining about one of the following: hair, skin, nails or weak bones (osteoporosis). Naka Brand Silicea gel is amazing for strengthening your nails. If you always have had ripples in your nails or if they are very thin and break all the time, this is a sure sign of a silicea deficiency. 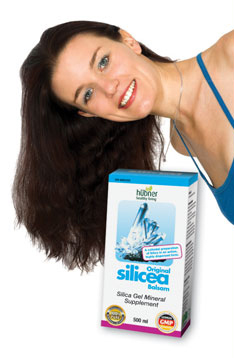 If your hair just won’t grow and it is falling out or it is thin with no life, definitely include silicea in your vitamin regime every day! When it comes to hair there are many components. Protein is very important and if you are vegetarian you may want to consider vegan protein sources such as Pumpkin Seed Protein by Omega Nutrition. Or Sequel Naturals has an excellent Vegan protein meal replacement as well. Hair is complicated to fix in that there is not always one easy solution. Often times it is a mineral problem, protein protein, and basically nutrient absorption problem. That is why it is also important for people to take digestive enzymes when nutrients are not getting absorbed properly. A great brand for digestive enzymes would be: Renew Life! Naka has a fantastic news article on their Silicea. Hope you enjoy the read. It is very detailed and an interesting read! We do mail orders as well, you can call toll free at 1866-499-9546.